subdivision of what had been a block of Maori land called the Kuakarau Block, Block 342, plus a tiny bit of the Whakanewha Block in the southeast corner (see the map). 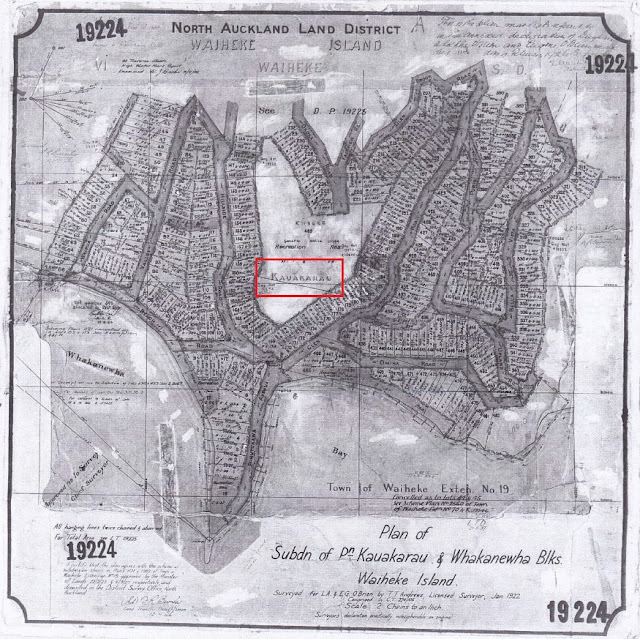 'Rocky Bay' as the name of the smallish bay where boats now bob on swing moorings first appears on a Maori Land Court map dated 1865, and is affirmed on a Crown map dating from 1877.
assigned by the Governor-General on behalf of the then Monarch, King George VI. But 'Kuakarau' and 'Rocky Bay' were ignored by the two Europeans who subdivided the Kuakarau part of their farm. Instead, for marketing purposes, and without Royal authority, they deployed 'Omiha Bay' and 'Omiha'. And although they were 100% European they covered their marketing prospectus with Maori symbolism, which they had no blood right to. Court carefully recorded. Nowhere is there any mention of an 'Omiha' or any name anything like it. official' on the New Zealand Geographic Board's gazetteer. See this blog for more details and other documentation.